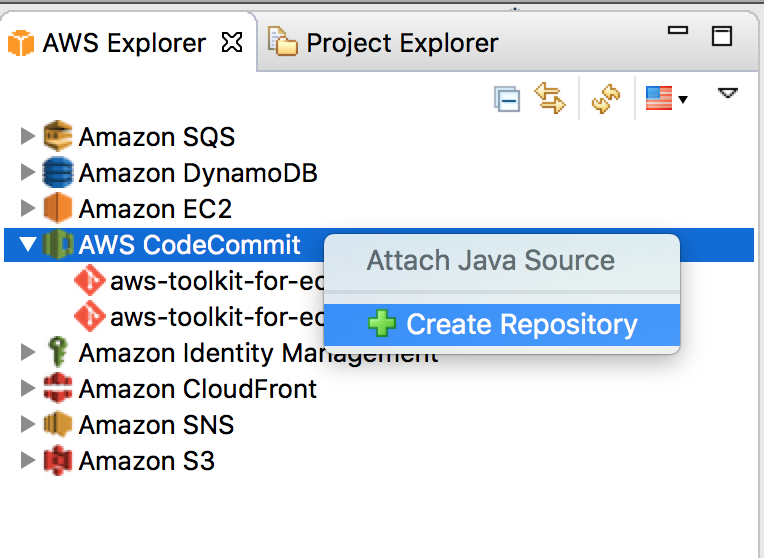 I am pleased to announce that the AWS Toolkit for Eclipse now supports AWS CodeCommit and AWS CodeStar. 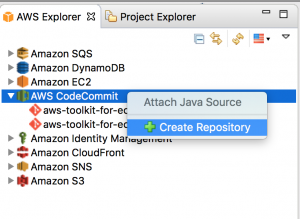 This means you can create, view, clone, and delete your AWS CodeCommit repositories in the AWS Toolkit for Eclipse. 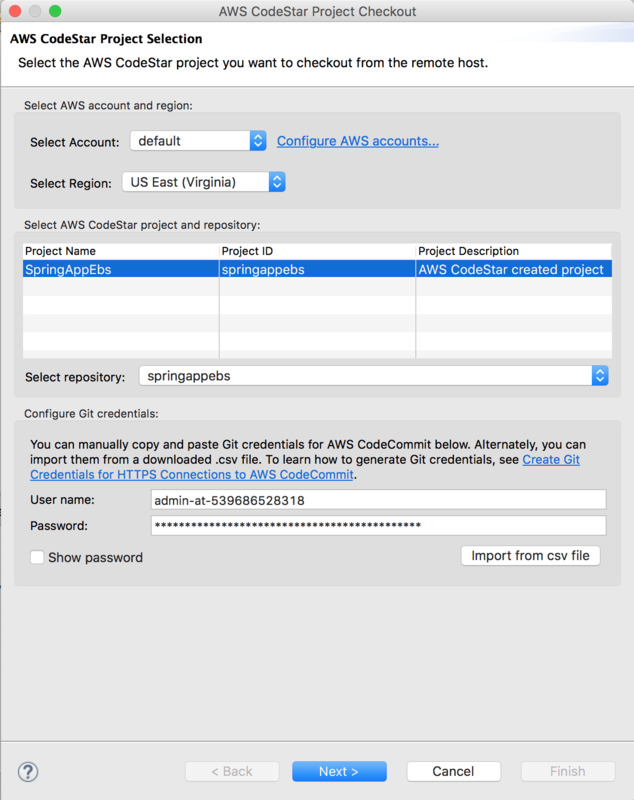 You can also import existing projects under your AWS CodeStar account directly into the Eclipse IDE. We recommend that you use Git credentials with HTTPS to connect to your AWS CodeCommit repositories. For more information, see Use Git Credentials and HTTPS with AWS CodeCommit. In the new version of the AWS Toolkit for Eclipse, you will see an entry for AWS CodeCommit on the Eclipse Preferences page, shown here. To install the AWS Toolkit for Eclipse, follow the instructions on the AWS Toolkit for Eclipse page. 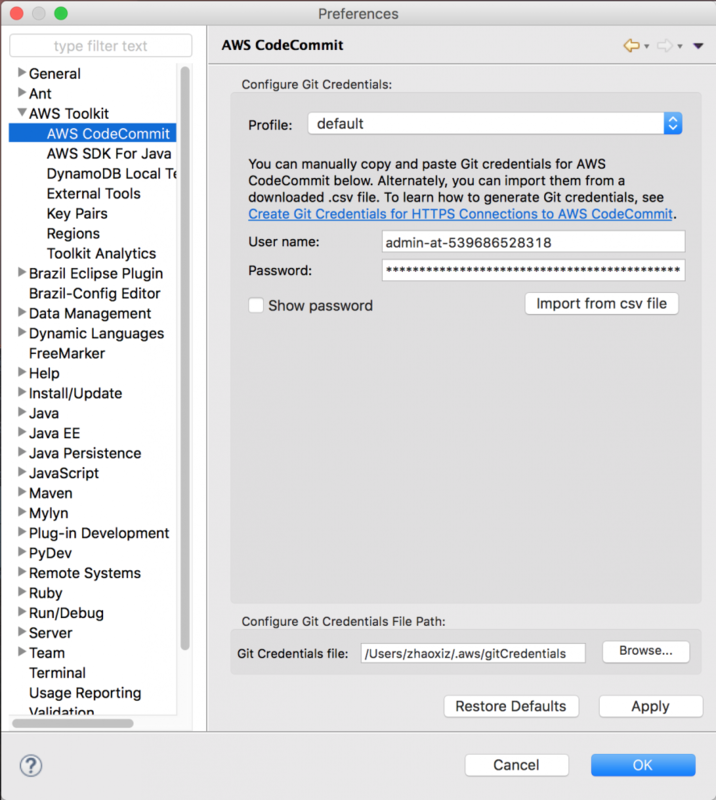 You can configure your Git credentials for your AWS accounts on this page. For information, see Create Git Credentials for HTTPS Connections to AWS CodeCommit. You can type in the newly generated user name and password into the text fields, or import the CSV file generated from the IAM console directly into Eclipse. An entry for AWS CodeCommit also appears in AWS Explorer, as shown here. To open this view, click the drop-down box next to the AWS icon in the toolbar, and select Show AWS Explorer View. You can create, view, clone, and delete repositories in this view. 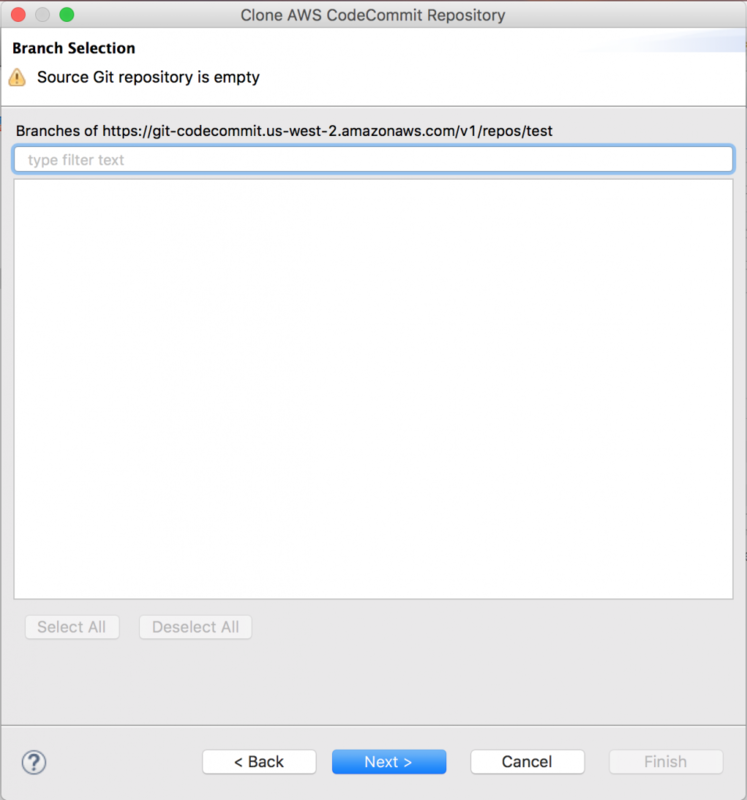 To create a repository, right-click AWS CodeCommit and then select Create Repository, as shown here. 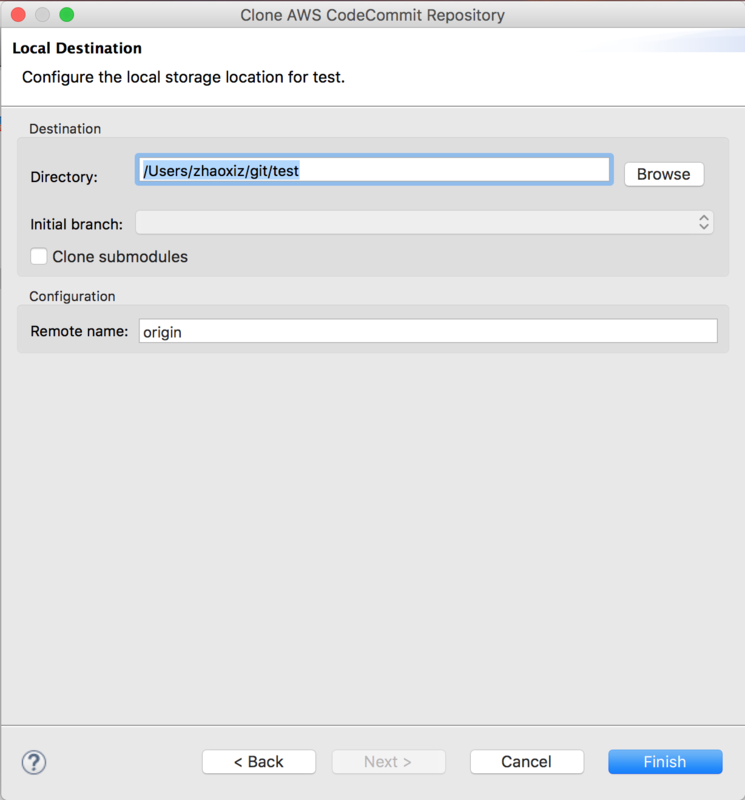 Type the repository name and an optional description in the Create Repository dialog box. The newly created repository will appear under AWS CodeCommit. To view a repository, double-click the repository name in AWS Explorer. This will open the repository editor where you can see the metadata for the repository, as shown here. The repository editor also shows the latest 10 commits for the selected branch. To refresh the repository editor, click the refresh icon on the top-right corner of the page. 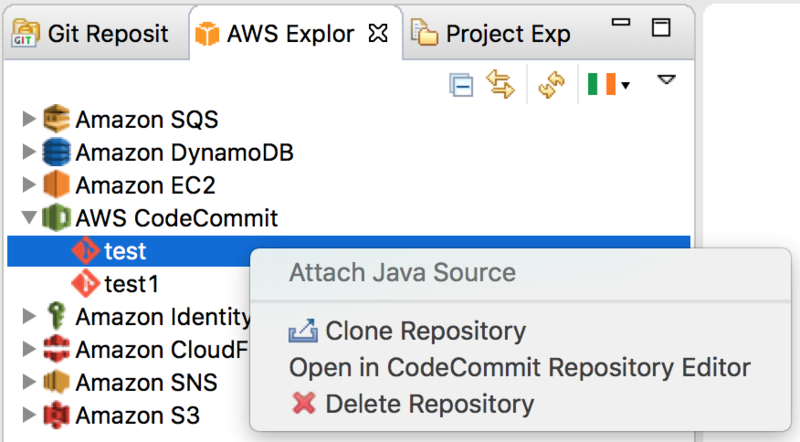 To clone a repository, click the Check out button in the repository editor, or right-click the repository name in AWS Explorer and select Clone Repository. 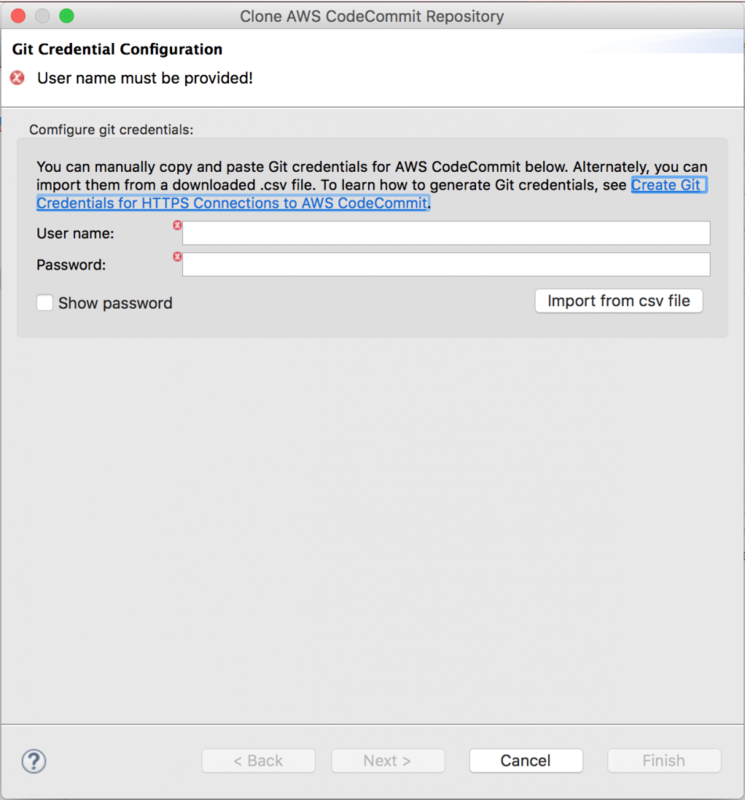 If you haven’t configured Git credentials for your current AWS account in your Eclipse, a dialog box will prompt you to configure them. After you have configured your Git credentials, you will see the following pages for selecting a branch and local destination. You’ll see these pages have the same look and feel as EGit. For information about EGit, see the EGit Tutorial. You can use the Eclipse EGit plugin for managing your projects with Git. 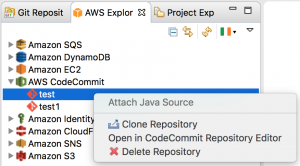 To delete a repository from AWS CodeCommit, right-click the repository name and select Delete Repository. When the following dialog box is displayed, type the repository name. You can use the AWS Toolkit for Eclipse to check out AWS CodeStar projects and edit them in the Eclipse IDE. To import your AWS CodeStar projects to Eclipse, click the drop-down box next to the AWS icon in the toolbar, and select Import AWS CodeStar Project. You will see all your AWS CodeStar projects under the selected account and region. The plugin for AWS CodeStar finds all the AWS CodeCommit repositories that are linked to the selected project. From the Select repository drop-down list, choose the repository, and then click Next. You can also configure the Git credentials on this page if they have not been configured on the selected account. For information about AWS CodeCommit, see the AWS CodeCommit documentation. For information about AWS CodeStar, see the AWS CodeStar documentation. We hope you find these new features useful. If you have questions or other feedback about using the AWS Toolkit for Eclipse, feel free to leave it in the comments.